Teaching someone to ride a bike can be a challenging and rewarding experience. Whether you are working with a young child or a middle-aged parent, the use of psychological theories about learning may help make for a quicker and more effective instructional process. Despite the existence of numerous alternative teaching methods, the principles of operant conditioning -- a method of shaping behaviors with rewards and punishments -- have been used successfully for nearly a century. Behavioral psychologist B.F. Skinner explained in the mid-1900s that learning involves changes in behavior in response to external stimuli. Known as a stimulus-response pair, this behavior and its consequences can be shaped through the use of conditioning. In contrast with classical conditioning, which involves involuntary, reflexive behaviors, operant conditioning focuses on shaping voluntary behaviors. By using rewards and punishments effectively, behavioral psychologists such as Skinner argued that you can encourage and teach almost any behavior to anyone. In operant conditioning, a reinforcement is anything that may strengthen or encourage a certain behavior. Positive reinforcement involves giving or starting something that the person enjoys after the desired behavior. Negative reinforcement, in contrast, involves stopping or removing something that she does not enjoy. 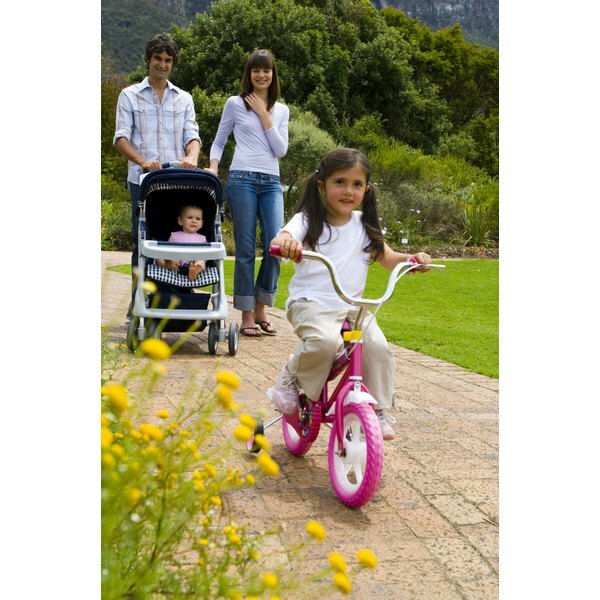 When teaching a child to ride a bike, positive reinforcers include encouraging words or extra play time, while an effective negative reinforcer may be a day without chores. While reinforcement targets and strengthens desired behaviors, punishment helps to weaken or steer someone away from an undesired behavior. Similarly divided into positives and negatives, positive punishment involves the introduction of something unenjoyable after a given behavior, while negative punishment involves removing or restricting access to something enjoyable. For a child learning to ride his bike, a positive punishment may be the use of belittling or angry words, while a negative punishment may involve taking away his TV privileges for the day. In general, punishments are less effective than reinforcements, with positive reinforcement being the most effective conditioning method. As such, you should try to use minimal punishment while teaching someone to ride a bike. Instead, reinforce each small step. When teaching your daughter, for example, you might wish to reward her for letting you push her on a bike without training wheels. Once she masters this, hold off on reinforcements until she makes further gains, thereby encouraging her to continue progressing toward riding on her own.